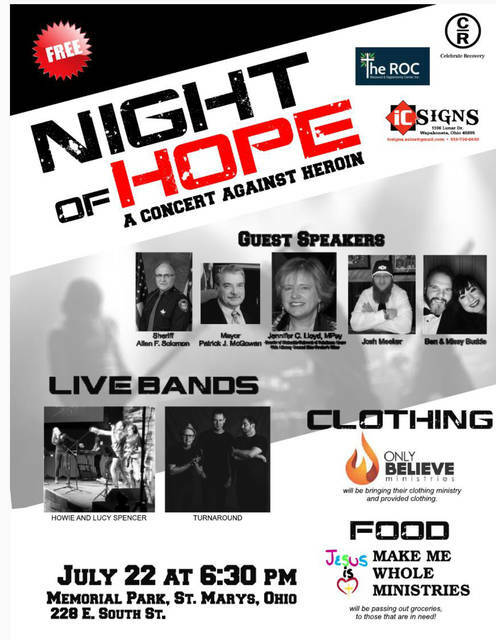 ST. MARYS – Night of Hope: A Concert Against Heroin is scheduled for 6:30 p.m. July 22 at Memorial Park in St. Marys, 228 E. South St. The free concert will include live bands Howie and Lucy Spencer and Turnaround. Guest speakers will include Auglaize County Sheriff Allen F. Solomon, St. Marys Mayor Patrick J. McGowan, Jennifer C. Lloyd, Josh Meeker and Ben and Missy Budde.